We are based in Bielefeld. 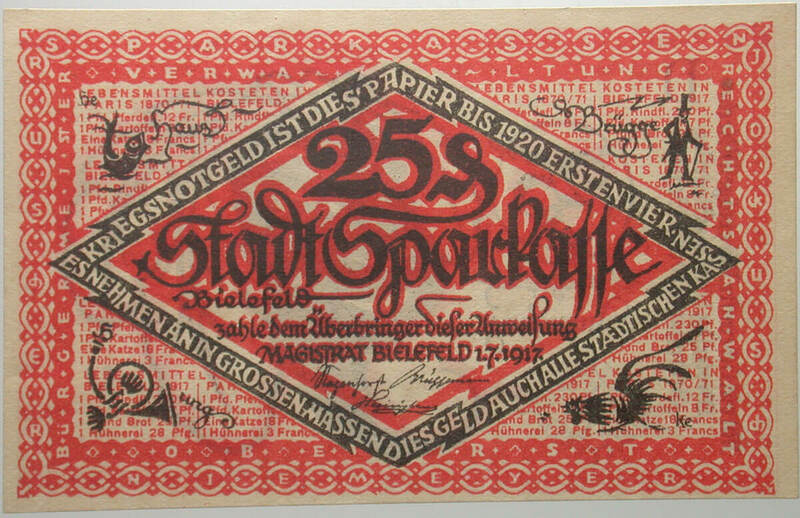 Therefore, we are your specialists for Bielefeld stoffgelds [banknotes made from fabric]. Would you like to know more about them? Here, you will find an introduction into the subject and numerous explanations of the interesting motifs. In the years after World War I, many cities in the German empire issued their own notgeld [emergency money]. At first, an actual shortage of coins was the reason, but later on, the notgeld bills, which were most often inexpensive to purchase, became a popular collectible. The city of Bielefeld was especially active and successful in the production of collectible notgelds. The person responsible for that was Paul Hanke (1870-1945), director of the Stadtsparkasse [town savings bank] Bielefeld until 1925. He not only influenced the banknotes’ design, but also elaborately described them in local newspapers in order to recommend them to his citizens as memorabilia from the past. 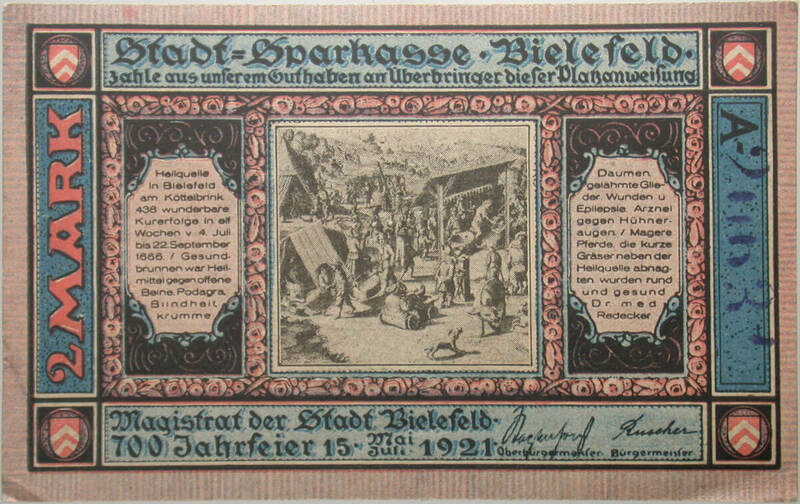 Especially on the occasion of the 700-year anniversary of the city of Bielefeld’s founding, he had plenty of notgelds issued. To set them apart from the competitor’s colorful bills, they were made from silk. 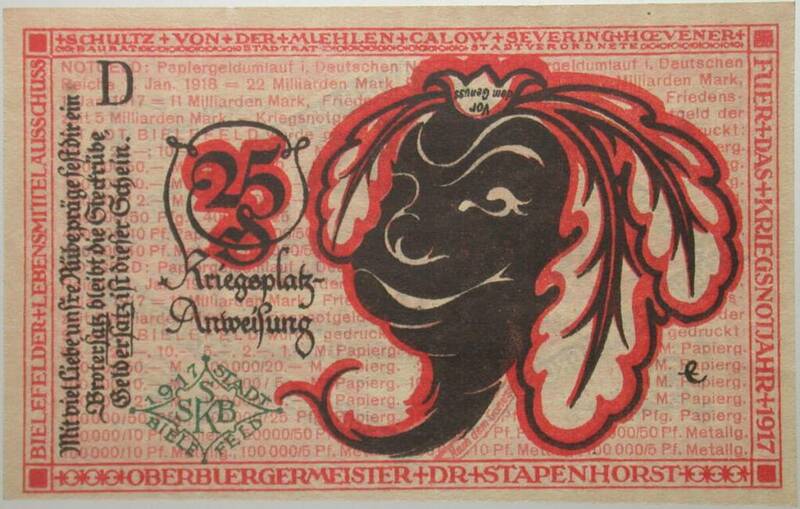 As a special rarity for collectors, some banknotes were even hemmed with an elaborate trimming. His article in the special anniversary edition of the magazine “Niedersachsen” of 1921 has been preserved, in which he soulfully describes a Bielefeld family in the year 2000, envisioning the history of their city with the help of these notgelds. Please remember that this article is a historical source expressing the ideology of German upper classes of the interwar period. Certainly we do not share this view on the events of the First World War. 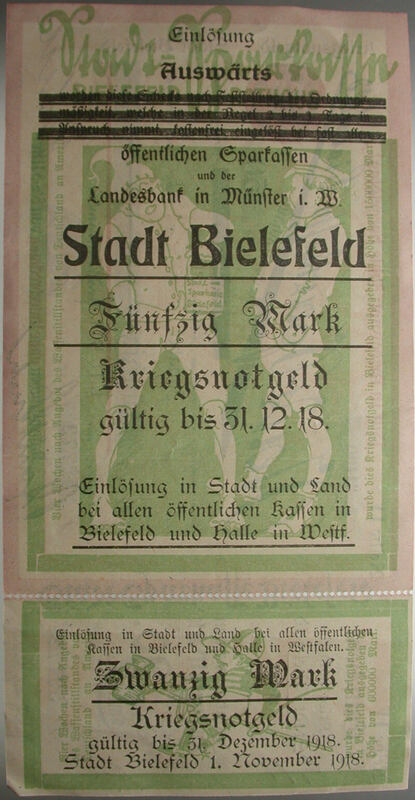 But we thought that nobody could describe the Bielefeld notgelds better than the person who designed it. It is winter, in the year of 2000. In the homey den of the single-family dwelling at Lehmstich street in Bielefeld, the weaver Hennerken Kralemeier is sitting. In thick clouds, he puffs away the Crüwell tobacco from a short soldier’s pipe, an heirloom of his grandfather’s. A cozy warmth fills the room. The town gas works provide the Bielefeld homes with the necessary fuel via a centralized heating plant. With curiosity, the ten-year-old son Christian looks at the beautifully-carved pipe bowl, knowing how much father cherishes the heirloom from the times of war. With this pipe, the grandfather had been portrayed as a linen weaver on the five-mark note of the city of Bielefeld on Christmas 1918. Durchhalten, in dem Krieg der Welt. And below there are listed all the numbers and foods your mother just mentioned. 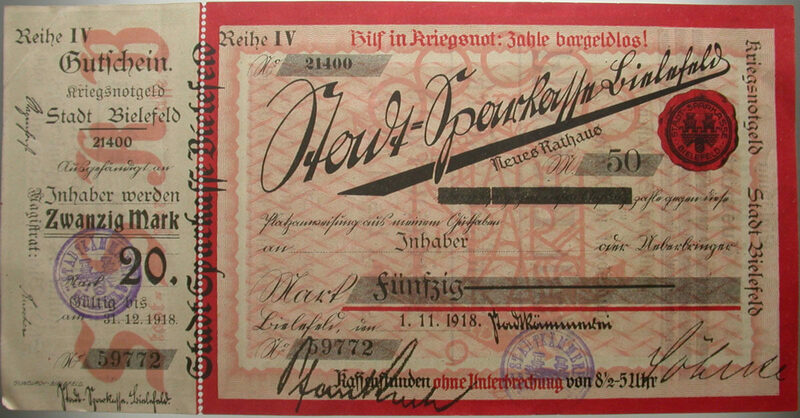 On the notgeld at 10 pfennigs, you can read the food prices paid in Bielefeld in 1917 and in Paris in 1870. In 1917, a chicken egg in Bielefeld cost only 28 pfennigs. But potatoes were so rare that, in the winter of 1916/17, 30,000 hundredweights of turnips were eaten in Bielefeld. 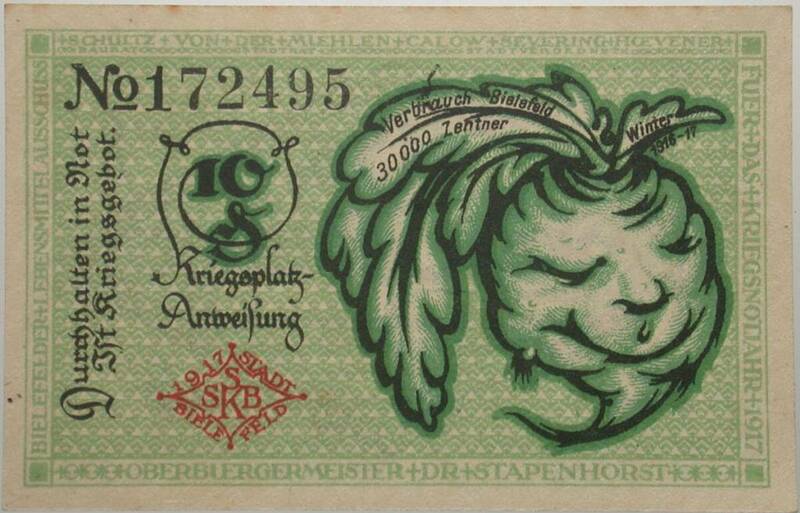 When you look at the 25-pfennig bill, you can see, by the turnip with a face, designed by the Bielefeld art teacher Eich, what a Bielefeld citizen looked like “before the indulgence”, and when you turn the bill around, you see how they would make a face “after the indulgence” in the turnips. 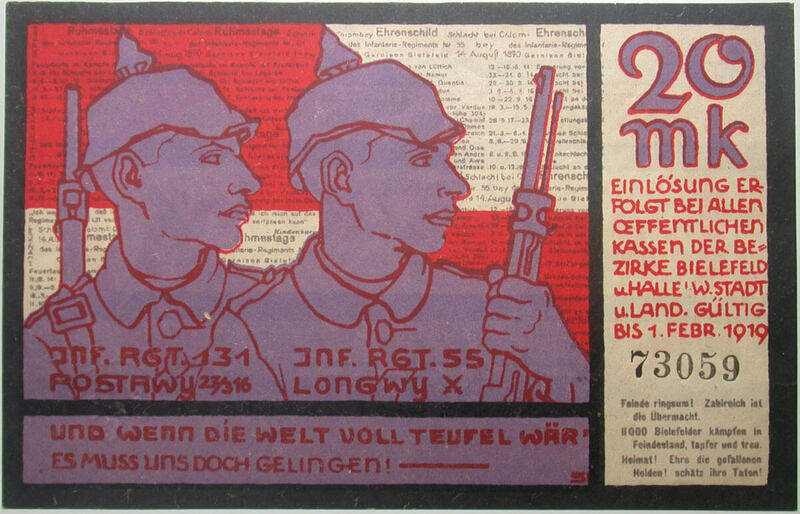 On every notgeld bill of the city of Bielefeld, you see new war memories, preserved in words and images. For hours, you can delight in looking at the banknotes. Those colorful, splendid bills unite Westphalian customs and cultural history, war memories and artistic capacities in their lively drawings. If you want to know when Germany sent off the truce offer to America, to President Wilson, or if you want to read up on when peace with Romania or Russia was made, or on which day Emperor Wilhelm II resigned and Germany became a republic, or when the People’s and Soldiers’ Council convened in Bielefeld, you only have to look on the five-mark note. It also shows the names of all the 29 states Germany was at war with. All the banknotes issued by the Stadt-Sparkasse Bielefeld together build a self-contained whole. United like in a book of remembrance, you can find all those war pictures artistically preserved that make the history of our home Bielefeld dear and valued to you. When grandfather was in the field on Christmas 1917, our troops had entrenched themselves. From the city of Bielefeld, grandfather received one of the 60,000 care packages that the Bielefeld war aid had sent out into the world as gifts of love. The Christmas package included a prize challenge from the Stadt-Sparkasse. 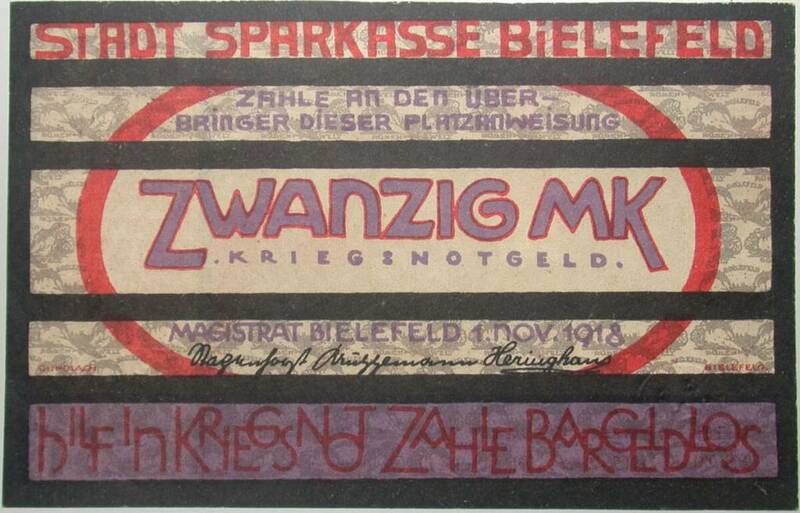 Our Bielefeld lads were asked to submit a poem or a drawing of the Bielefeld turnip for the banknotes; the best submissions were to be awarded special prizes. Now, can you imagine, son, what great fun that was? Half a wagonload of poems was sent to the Stadt-Sparkasse Bielefeld. 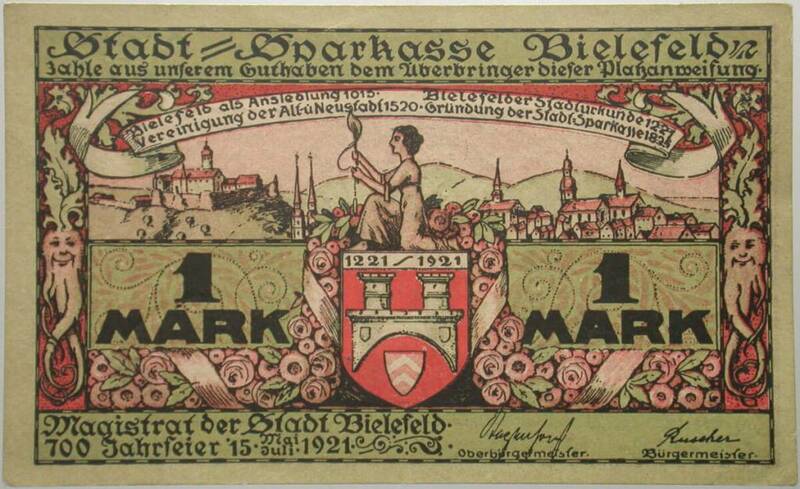 The turnip design from the ten- and twenty-mark bills ‘Bielefeld, Rübenfeld’ [Bielefeld, turnip field], which was rendered in small on the ten- and twenty-mark bills, had been drawn by a Bielefeld soldier in the trench. The two-mark note can be held upside-down, it looks the same from above and below. 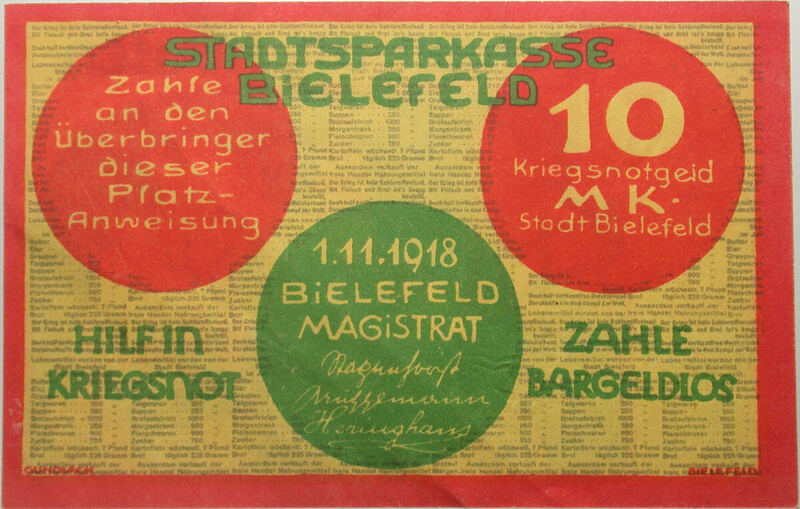 The war editions of the city of Bielefeld feature exact numbers of usage. 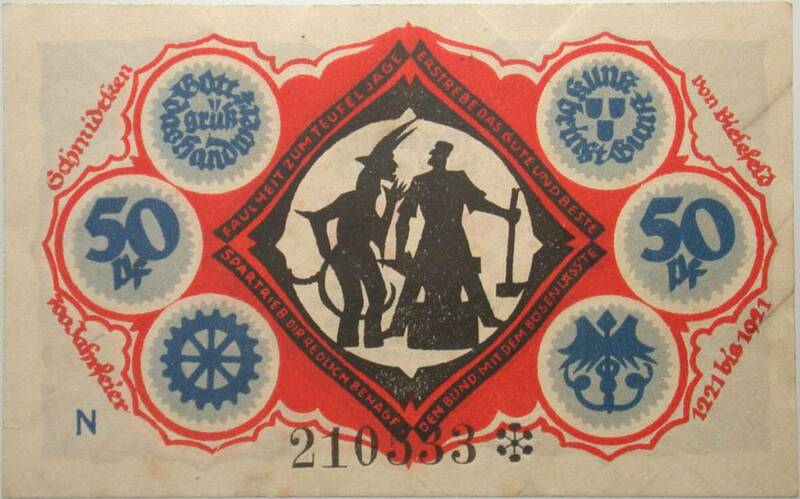 The one-mark note bears the slogan ‘Freie Bahn dem Tüchtigen’ [free passage for the hardworking] and the background ‘Bielefeld, Leinenstadt, schöne Stadt’ [Bielefeld, city of linen, city of beauty]. 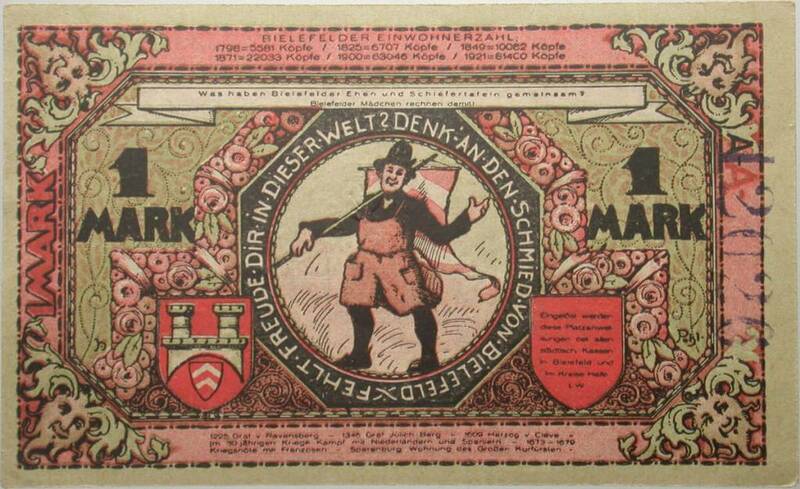 The people’s humor got a good hold of the one-mark bill: The vaulting soldiers on the reverse have been interpreted as Minister Severing, who used to be city councilor of Bielefeld, leaping over the Bielefeld mayor, through his appointment as minister. “Yes, father” says Christian, who had followed his father’s explanations with bright eyes, “here on the following pages in the album, there are even more artistic vouchers with the ‘Bielefeld healing pool’ and the ‘Bielefeld blacksmith’, what does that mean?” “Look, son” the father explains, “these new bills are from a second series, covering Bielefeld’s history of 700 years. In the olden days, Bielefeld belonged to the county of Ravensberg. War and terror of the ThirtyYears’ War did not leave the Bielefeld town of linen untouched. The fight against death and devil, sickness, plague and women’s schemes, is illustrated with these notgelds. You have surely read about Professor Steinach in some old book, who, 80 years ago, wanted to rejuvenate the elderly. Now, you see, the Bielefeld people already had a so-called fountain of youth four hundred years ago. The very fine silk 25-mark note that you see here is the gem of the collection, drawn with artful line management many years ago by Mr. Muggly, teacher at the Bielefeld School of Arts and Crafts, who passed away in 1999. Mr. Muggly had a skillful hand at glass painting. At the war memorial on Oberntorwall, there is still the little weather house with the pretty, colorful mosaic glass works he made. Bielefeld used to be a spa town until 1666. 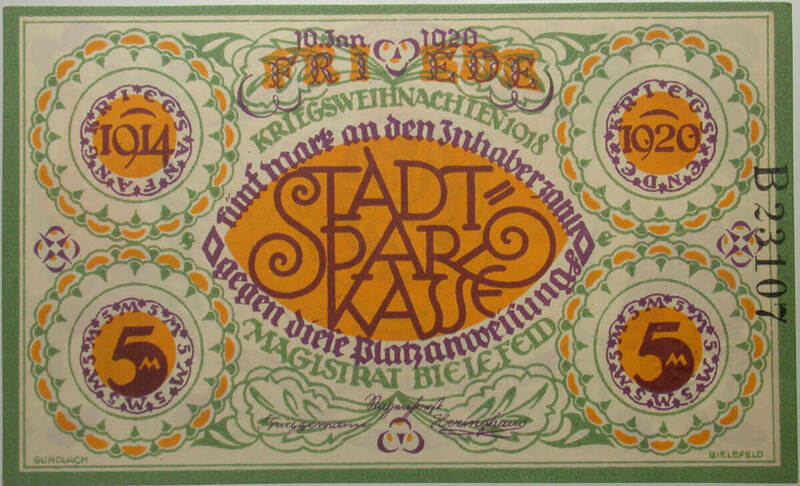 On the Köttelbrink, which would later become Kaiser-Wilhelm-Platz, where today there is the forum with the magnificent townhall, the large reading halls and the Stadt-Sparkasse with the town bank, which, at an interest rate of 3.5 % for check money, makes a turnover of 120 million a year, and which is so large that you can drive from one department to another with a town automobile, on that square, there used to be the Bielefeld healing pool. 438 healings were achieved within ten weeks. Doctor Redecker, who also used to be the mayor of Bielefeld, confirmed this, as you can read on the two-mark note issued on occasion of the city’s 700-year anniversary. Professor Steinach tested his rejuvenation cure mostly on rats and bunnies and only few humans. The fountain of youth so humorously depicted by Mr. Muggly, where old maids step in with their canes, only to come out in vibrant beauty, fresh and youthful, shows the stunning successes of the Bielefeld rejuvenation treatment for the fair womanhood. Until today, on the Bielefeld Obernstrasse, you only ever see beautiful young girls. Professor Steinach has been brilliantly defeated!!! No one ‘spit’ in the creek. This and other memories of Bielefeld joys and sorrows are illustrated with the new series. The 25-mark bill is printed on Bielefeld silk by the company Gundlach of Bielefeld. 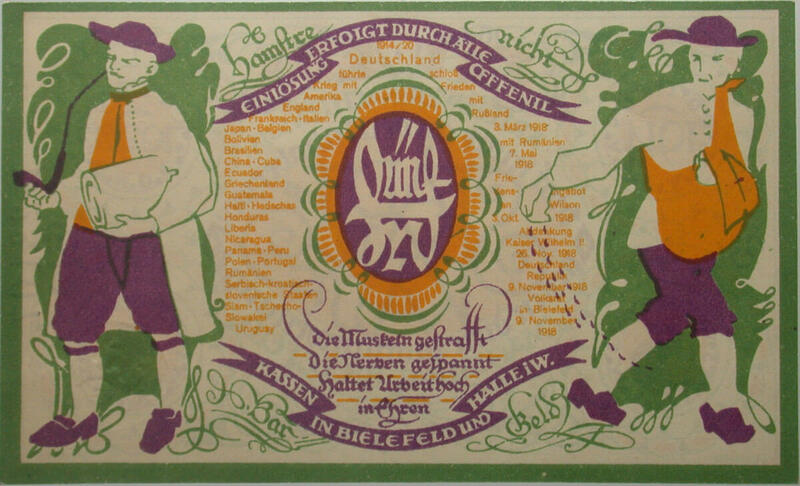 There are also anniversary notes made from Bielefeld linen, the fruit of our Bielefeld industriousness. Numerous lovers of the unique Bielefeld notgelds have expressed their lively interest by strong demand for the new banknotes. Bielefeld wants to go its own way as regards notgeld. Not imitation, but individual character, Westphalian customs and Ravensberg creative urge are suitably expressed in those novelties. One- and two-mark bills feature, apart from statistical data from the 700-year history of our hometown, Bielefeld specialties in highly artistic design. 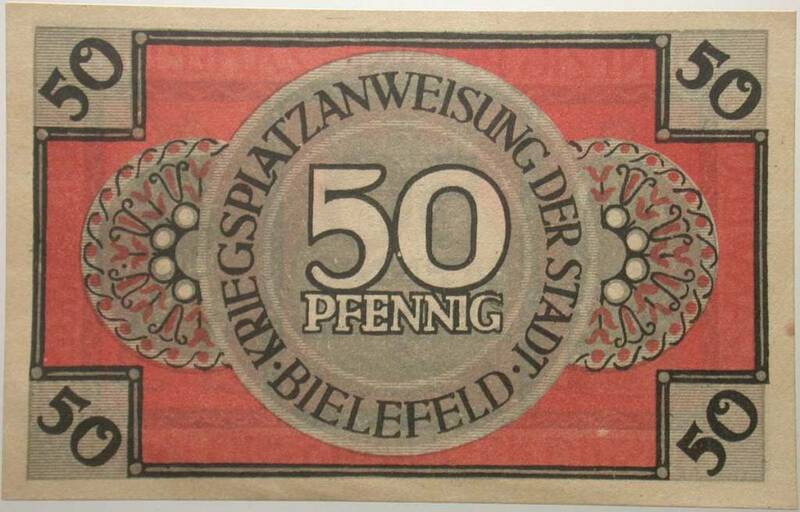 House labels, like the ones still attached on the old Bielefeld jewelry house today, can be found on the banknotes. As the noble courts used to show their coat of arms, Bielefeld citizens had gotten themselves house labels in the 16th and 17th century. Similar to today’s factory brands, those labels were preserved in the family from generation to generation. Husband and wife often had similar labels with slight deviations. People who could not write used their house labels as personal signature. On the gable of the Consbruch house on Obernstrasse, which today makes the beauties of the ancient house visible once more, in the upper part, you can see the house label which is also represented on the Bielefeld banknotes. Someone who would like to learn about all the countless specialties featured on the bills should get themselves a master collection of the Bielefeld artistic efforts. 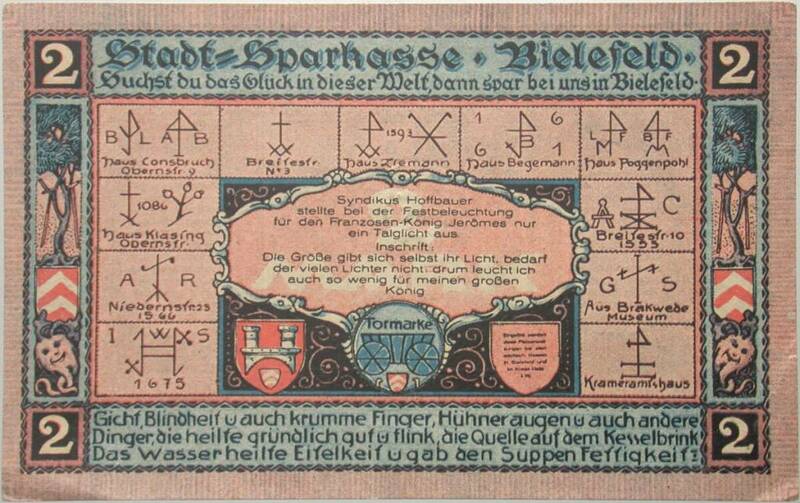 For its banknotes, the city of Bielefeld also adopted the old Westphalian tradition of attaching inscriptions on farmhouses. Lusty images, as they can be found carved into the wood on the gables in colorful design, are present in Bielefeld notgelds as well. All bills bear mottos fitting the down-to-earth character of our Ravensberg people. 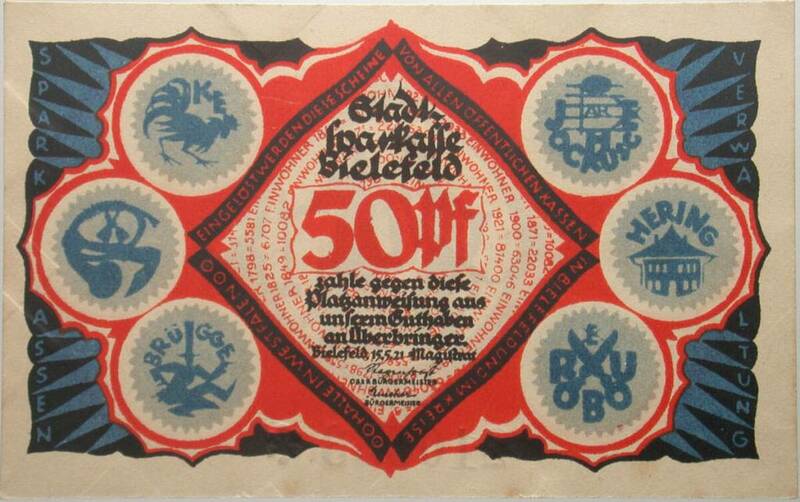 On the smaller banknotes at 10, 25 and 50 pfennigs, you will find the names of the members of the savings bank administration in rebuses: Heringshaus, Horn, Ruscher, Jockusch Brüggemann, Hanke. 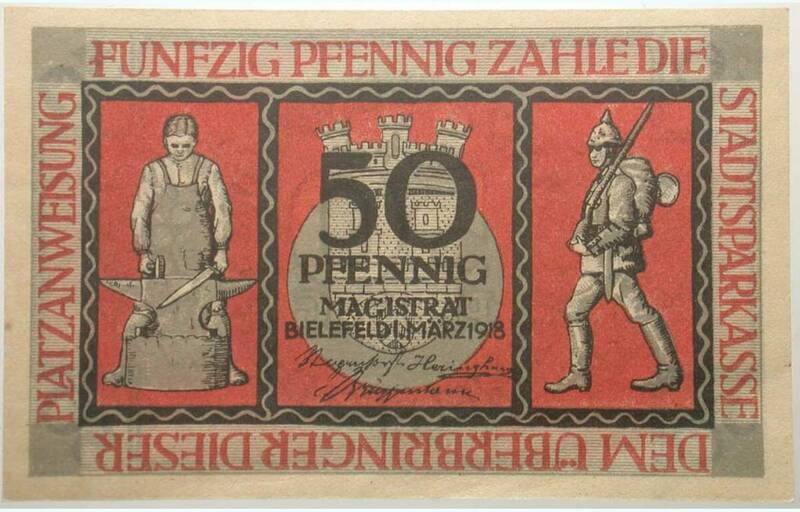 Old legends from earlier centuries resurface on the 50-pfennig bills issued for the 700-year anniversary. 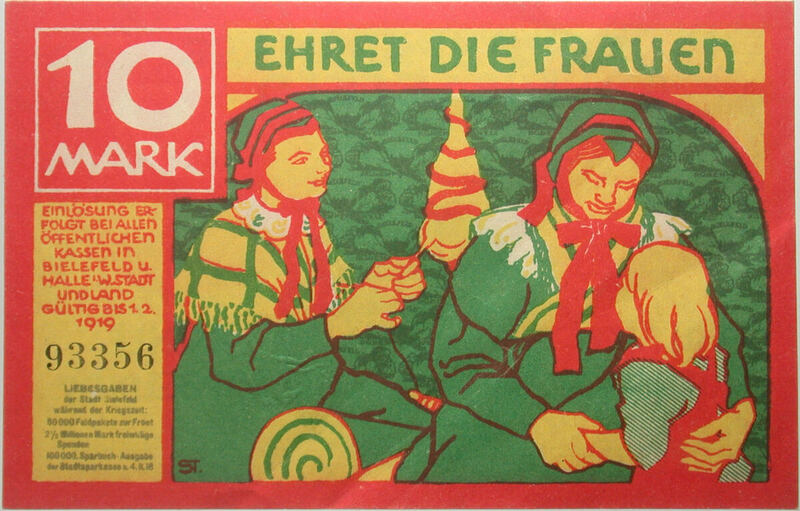 Look, son, the silhouettes on the 50-pfennig bills are masterpieces. They were produced in black-and-white fashion by Mr. Schreiber, co-owner of the Bielefeld art printing company Klocke & Schreiber. In earlier centuries in Bielefeld, hand weaving developed into machine production. The silhouettes, too, have gained world renown during the last 80 years. 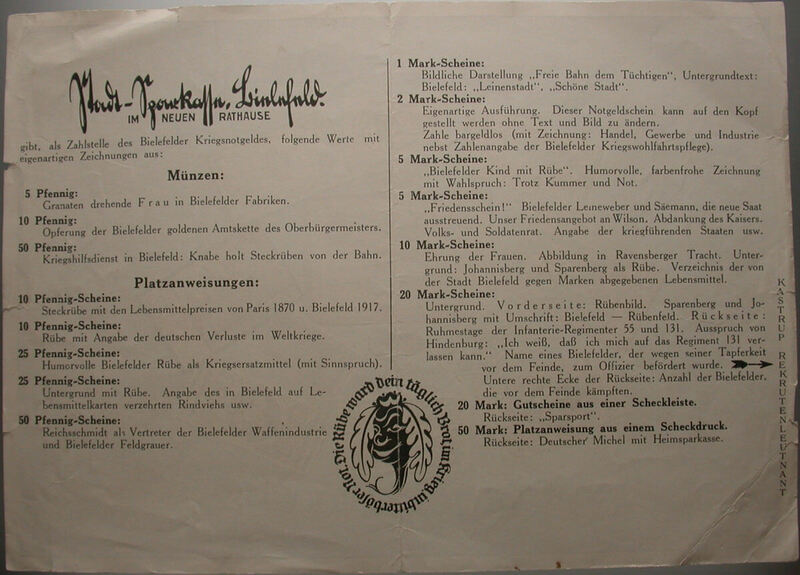 The Bielefeld notgelds were sent to America and Spain, to Switzerland and Holland. The artistic silhouettes found such great appreciation that the city of Bielefeld founded its own shear factory. On the street Am Grünen Winkel where the Heepen spruce trees stand, you can see the many little cottages where the 800 employees live who work at the town shear factory. Grandfather always said, ‘Cherish the notgeld bills.’ The unique, artful banknotes increase in value every year and constitute a big fortune today.